As a step along the path to curing my funk, I decided I’d do something “just for fun” today. Again it was raining out—a true northeast spring. Normally I’d sketch or paint in my sketchbook for fun, but I decided this time to do an ACEO-size painting (click here if you don’t know what that is) from my studio window. I had such a great time, and love this little painting to bits! 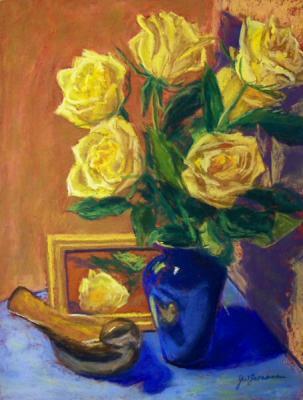 The image above is much larger than the actual painting. Depending on the size of your monitor and your screen resolution, the painting as shown below is probably closer to the real size. At this small size, it really shows how much detail the painting has. Isn’t it adorable? By the way, you can get standard size frames for these at Michael’s Arts and Crafts and other stores. They also look great on little table easels. It’s raining out today, but I’ve been in something of a painting funk and really wanted to break out of it today. 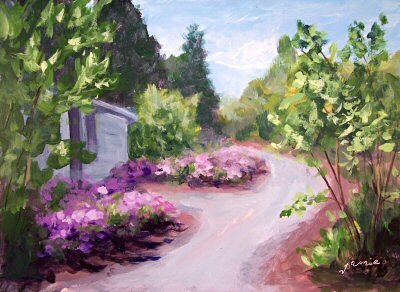 I pulled out some spring photos that I took at Lasdon Arboretum and painted this one of the azeleas near the potting shed. It cheered me right up to paint spring colors! I set out way more colors than my usual limited palette and dipped into just about everything, though I could have easily painted this with just a few colors. It was that kind of day! I’m sure I must be forgetting something! There is so much to paint from this one spot in scenic New Paltz, New York, that I think I could go there every day for a month and not run out of things to paint by just facing in different directions! Don’t you just love warm late day light and strong shadows? I got to spend it with my easel, down along the banks of the Hudson River. Please click here to play the audio file of Andy Lafreniere and me playing a pair of Humphrey guitars while you read this post. The piece is “The One”, by California composer Peter Madlem. When my Ramirez classical guitar slipped from my grasp on a flight of stairs in 1979, splitting in three places, it led me to the doorstep of classical guitarmaker Thomas Humphrey. As I rang his doorbell on West 72nd Street in Manhattan, with my damaged instrument, I didn’t know that I was about to meet one of my closest friends, or that I’d end up owning four of his amazing guitars, or that our future spouses and children would play together in the brooks behind our house and his, and that we’d watch them grow together until his untimely death last Wednesday. 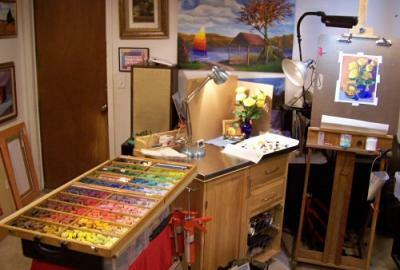 Tom’s entire workshop at that time was crammed into a small bedroom in his New York City apartment. He worked day and night, tirelessly unlocking the secrets to producing instruments with a sound he heard clearly in his head, but not yet in a classical guitar. Already well-known as a luthier in New York, his apartment was affectionately referred to as Grand Central Station. Musicians would congregate, friends would come and go, and there were more fabulous spur-of-the-moment classical guitar performances there than in the concert halls of New York City. Tom’s magnetic personality, wonderful sense of humor, and beautiful-sounding instruments drew guitar players from near and far. His reputation sky-rocketed when he developed and patented his Millennium design, and his name became a household word for guitarists world-wide. The elevated fingerboard gave players easier access to the high reaches of the instrument, and combined with his unique bracing design, increased it’s projection. When C.F. Martin approached Tom about making two models that copied his design, my husband and I tried talk Tom out of it. But those who knew Tom know that it was always futile to argue with his vision. While we were afraid that it would lead to loss of business for his own handmade instruments, Tom felt it would force him to have to invent something even better. And so his search for the next great breakthrough continued. Like all great artists, Tom was never satisfied. He always wanted more volume, fuller sound, better sustain. Tom was as much a philosopher as he was an artist and inventor. 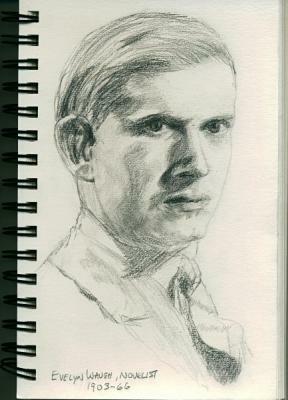 He looked at life as a creative journey, and pressed ever-onward along his ingenious path. It wasn’t unusual for my phone to ring early in the morning, with Tom’s excited voice on the other end, explaining his idea for a new bracing pattern. 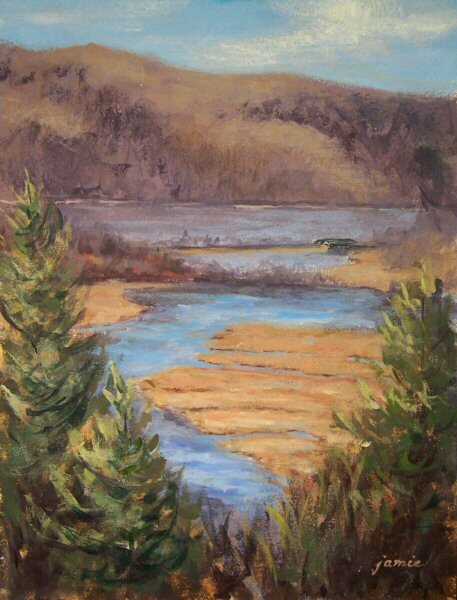 Once Tom and his wife Martha moved up to their estate in Gardiner, NY, I’d often bring my paints along on visits to capture the Shawangunkill River that wound through the back of their property, or the white cliffs of the Gunks that faced the front. 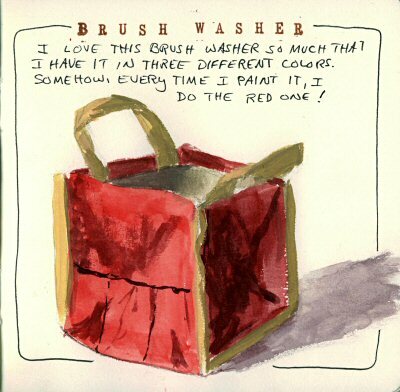 But often as not, we’d get absorbed in conversation, talking away in the workshop for the day, or playing his latest batch of guitars one by one, and the brushes would remain in my easel. When I rang that doorbell in New York City in 1979, and as we had our first philosophical conversation, I didn’t imagine that his voice would be silenced at the young age of 59. Tom’s sound will forever live on through his instruments, and I am grateful that I will hear him speak every time I pick up my guitar. You can click to read the New York Times Obituary. This painting has been published in Plein Air Magazine. 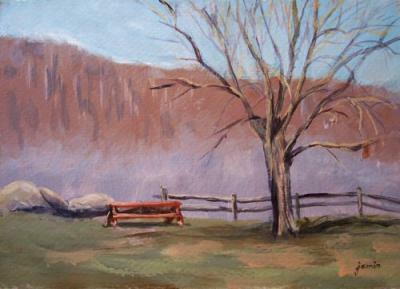 It is one of my favorite early spring plein air paintings, done at Ward Pound Ridge Reservation in Pound Ridge, New York. Everybody loves visiting an artist’s studio and seeing paintings come together, so I thought I’d share part of the process of this painting. 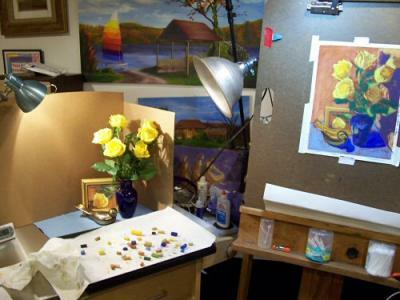 Here’s a photo of my setup in my studio, along with the pastel in progress. The pastels on the paper towel are the ones I selected from my huge box of colors. Setting them aside like this makes them easier to find, and helps maintain a unified palette with good color harmony. Above is a photo of the full area of my studio where I was working on this piece, so you can see the whole pastel box. I think now you can see why I find it necessary to separate the colors I’m using in a particular work; otherwise I’d be forever looking to find them again! This is an image of the painting about 1/3 of the way through the process. The basic color plan has been made and the objects blocked in. Following this stage, it’s time for refinement. 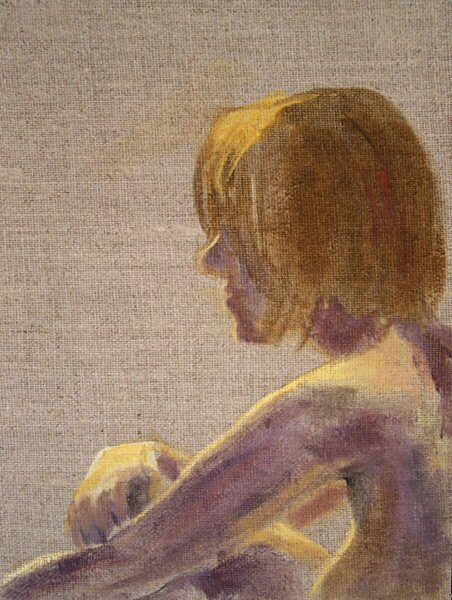 Most of my time on a painting is spent in the refining stages. I hope you’ve enjoyed this trip to my studio! 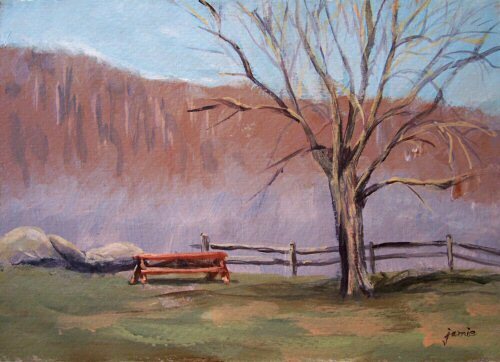 This was painted at Muscoot Farm, Somers, NY, in the Hudson Valley. 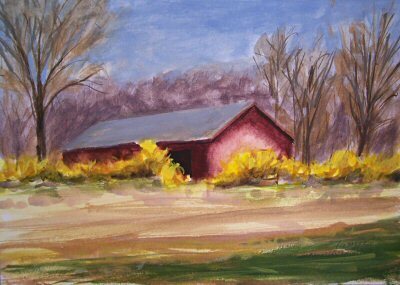 The forsythia was so colorful against the red barn that I had to stop in my tracks and paint it. The fields at Muscoot are newly plowed and all the animals were out enjoying the spring sunshine. $600.00 plus $30 shipping and insurance within the Continental United States. For local sales, shipping charge will be allocated to NYS Sales Tax. Please email me at JamieWG@aol.com for International purchases or with any questions. It’s hard to beat springtime in the Hudson River Valley. This is a scene from Teatown Lake that I paint every spring. This morning, it seemed like I didn’t have my head screwed on quite right. I left the house feeling disorganized, had to pack up on location before leaving the car, and ended up forgetting my water. You can’t paint with acrylics without water! I went back up to the car to get the water, got back to my painting spot, and realized I didn’t have paper towels or my glasses! I managed to use old, somewhat soggy paper towels that were stuck in a zip-lock bag in with my painting gear. That didn’t solve the issue of the glasses, but sometimes painting without my glasses can help me see the big shapes without getting bogged down in unnecessary detail. 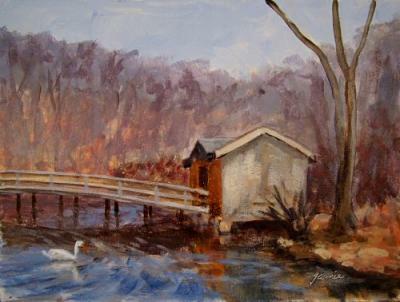 The swans were nesting again to the right of the bridge, where I see them every April. It’s a tranquil spot with a magical feeling. For once I left the stream out of my painting. 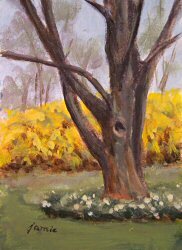 The recently-opened forsythia blossoms and evergreens caught my eye, along with the chunky textures of the big willow trunk. It was a gorgeous afternoon, but still very cold. In spite of the spring colors, I wondered if spring is really here. Maybe it’s just an optical illusion! One of the nicest things about the Constitution Marsh overview from Boscobel at this time of year is that the foreground foliage doesn’t obscure so much of the marsh. 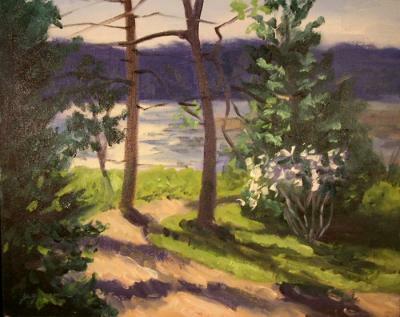 I really enjoyed being able to paint a couple of vertical compositions there this week, instead of the usual horizontal Hudson River views that we usually see from this vantage point. With the day being heavily overcast, I searched for a strong composition to make a convincing painting. It didn’t look like the clouds were going to break today, but I decided to take a chance and drove down to Teatown Lake Reservation in Ossining, New York. The sun was in and out, but it did peek through long enough to light up the scene for me a few times. The swans are back there nesting on the other side of the bridge, and one would swim under the bridge past me, and back again, every so often. The last time he swam by, I was just finishing up the painting. It was the perfect time to put him in! 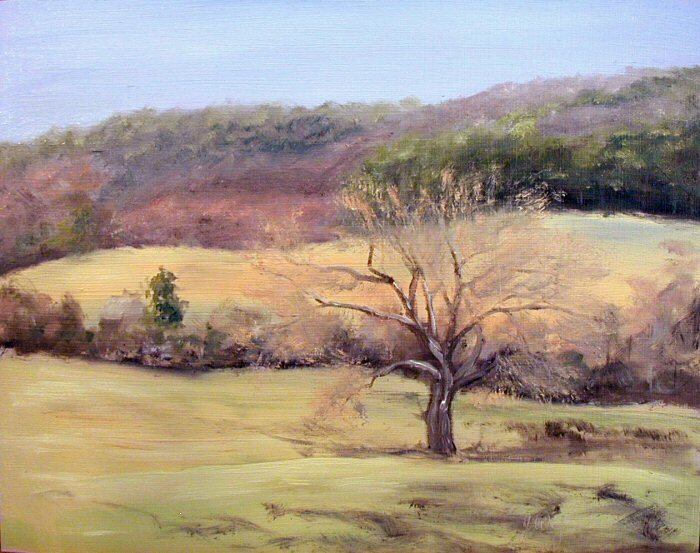 I paint this scene every spring, but usually from the other side. I’ll be going back again next week, so there’s still a chance for me to do my usual vantage point. 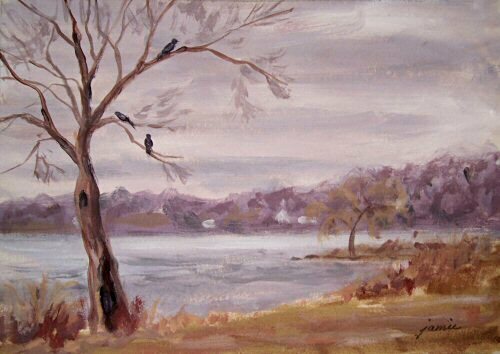 There are a few scenes that I like to paint every year. They serve as a sort of barometer for me as the years go by. I can see changes in style, color, and ability as the years go by. 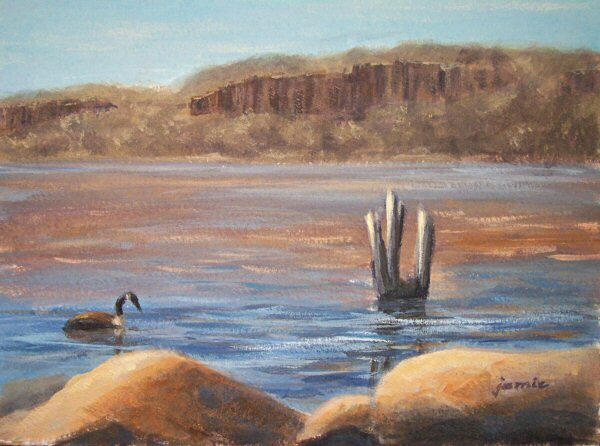 I’ve always found this scene extremely challenging, which is why I like to paint it every year. This morning was dull and overcast along the Hudson River at Boscobel Restoration, but later in the morning, the sun broke to the north. 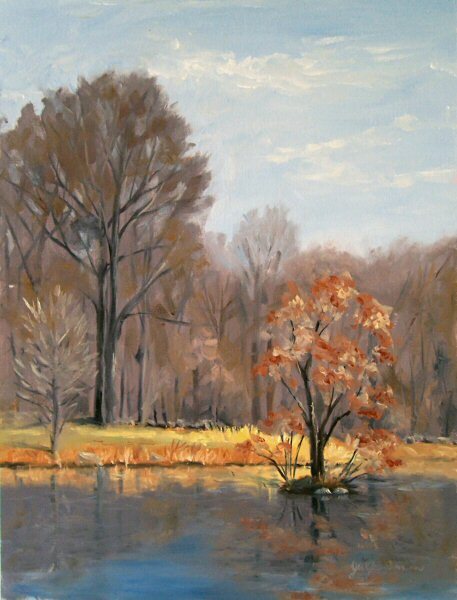 I faced the sunny side to do this painting, while the color was still grey to the south. 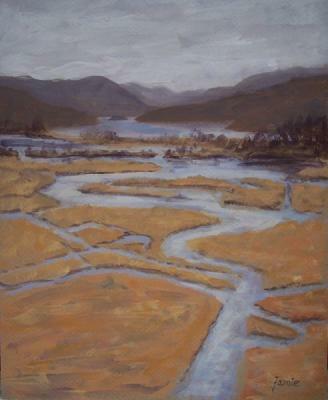 Constitution Marsh is still rather brown. Most of the spring color has yet to emerge up here. It was dreary and overcast, so I spent a lot of time doing some sketches around the house. 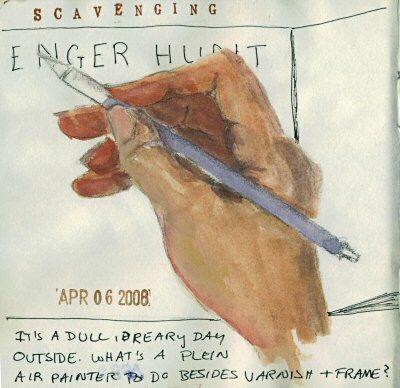 These were from the list in the current Wetcanvas Scavenger Hunt. If you’re ever trying to decide what to sketch or paint, and like to share your work, jump in and join the fun! 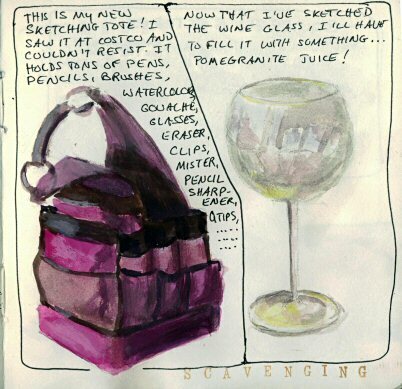 I did all the sketches in gouache, in my 5.5×5.5″ Hand Book Journal. I’ve also been trying out the new Prismacolor markers, which are permanent and lightfast. They are similar to the Pigma Micron pens. I got a set of the black ones in different thicknesses, and like them a lot. 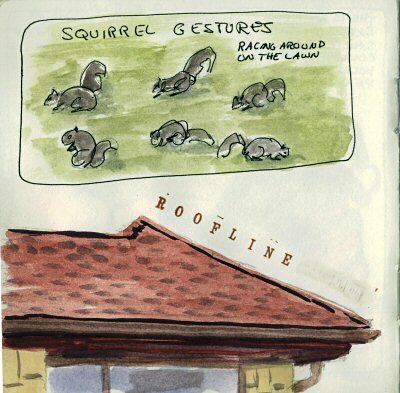 If you think one minute figure gesture drawings in open studio are hard, try drawing squirrels in your yard! They don’t stay still for an instant. This was a fun challenge. The Scavenger Hunt had “pail/bucket” on the list, so I painted my favorite little travel water bucket. This is my first book in a square format. I think I like it a lot, but wish it were just a bit larger. I may go back to a 5.5×8″ size for my next sketchbook. I almost changed my mind last night about going out to paint plein air at sunrise when I heard it was going to be overcast. However, I found myself awake at 5am, and since I was already packed up to go, I decided to go anyway. I was thinking that I’d just do some value studies, but as the sun came up and I saw the beautiful soft colors, I couldn’t resist the color work. Now I’m so glad I went. I used just one each of red, yellow and blue, plus white. The birds really were sitting there on the tree just like this. 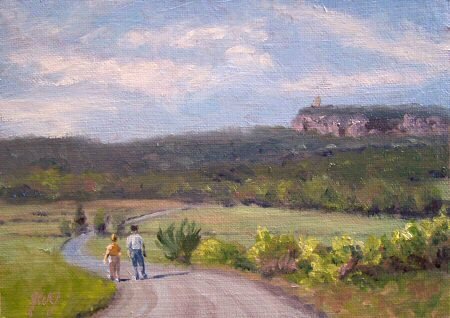 Some deer trotted by too, but I couldn’t get them into the painting in time. 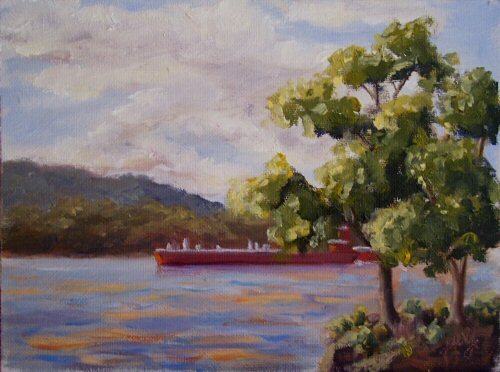 This oil painting of a red barge on the Hudson River was done on location at the Vanderbilt Mansion property in Hyde Park, New York last year. There is so much to paint there! It is one of my favorite places to paint along the Hudson. The painting is dry, varnished, and ready for a frame! 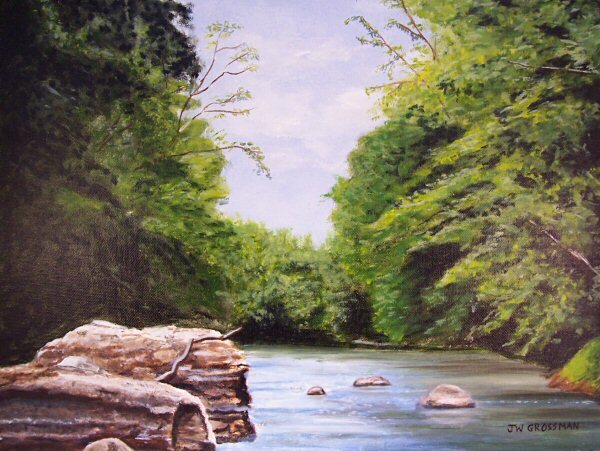 Some days just get too hectic to paint. I’ve been very busy framing and varnishing, so it’s a good opportunity to show something that hasn’t appeared on my blog for a long time. I’m really looking forward to the change of seasons and getting back up to Hyde Park to take in the cherry blossoms in the Italian Gardens! 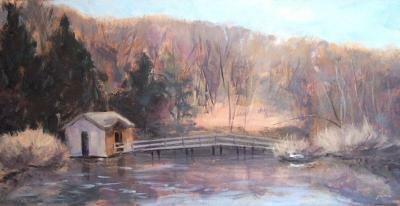 Art Sale in Katonah tomorrow. One day only! On Sunday, April 6, there will be an Art Sale at Katonah Art Center, 131 Bedford Road, Katonah, NY, from 10am-3pm. 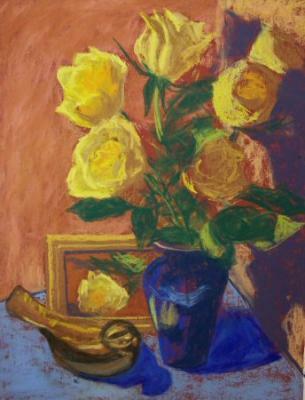 There are a dozen of my paintings there, beautifully framed, at very reasonable prices. This sale is one day only! You can call Katonah Art Center at 914-232-4843, or visit their website at http://www.katonahartcenter.com. Some of my favorite, small format, new works are there, including many of my recent still life paintings on linen, and some of the new landscapes too. The Art Center is simultaneously hosting an Open House, so you can also check out the studios and all the new spring class offerings while you’re there. They have a wonderful faculty. 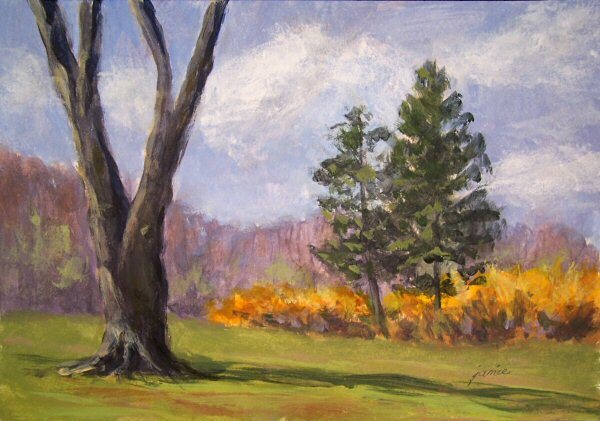 This was painted on location at the Rockefeller State Park Preserve. It’s one of my favorite early spring locations, with subtle color and beautiful Swan Lake.